The first ones to arrive in MA, brush up! This is usually the first one to arrive. Gold bird, medium sized warbler, rufus hat. When they arrive in MA they are often found lower than usual / on the ground looking for anything they can munch on. Song is a rapid trill. More “musical / pleasant” than a fast chipping sparrow, faster than many Junco trills. Slimmer than palm, no hat, very slim beak, has streaks on the breast usually. Also a triller. They remain higher in the trees on arrival. Spectacular bird, if it has arrived you can’t miss it- also they will arrive by the dozen so worth waiting for a good visual. These also trill, which is another reason it is good to get a visual. The trill is slow, very “sing-song”, and has a downward inflection at the end. If there are a bunch sticking around for the summer, try to watch some sing- soon enough you will be able to pick out this trill from the others. Looks like a zebra – always acts like a nuthatch (clings to trunk and branches). This one trills like a rusty wheel. It can easily be distinguished after a bit of birding with some around. Adult males look like a late 50’s hot-rodded American muscle car: long, low, two tone paint job. Matte/luster black with flame accents. Can’t miss it. The females and young males are buff (chrome, to keep in style I guess) with yellow accents. Look for behavior- if a “female” is getting beaten up while trying to sing a song in the same area, it is actually a first year male failing to establish a territory due to obviously being a youth. Here you can see more than 800 points, each describing an observation of an individual bird. This data is in the form of KML, a sort of XML document from Google for spatial data. I want to know which points have “pair” or “female” in the description text nodes using R. This way, I can quickly make and update a .csv in Excel of only the paired birds (based on color bands). robust, as I can work immediately with the output as a data frame in R, rather than a list of results. First, open an instance of QGIS. I am running ~2.8 on OSX. Add a vector layer of your KML. “Command-A” in the point dialog to select all before import! Next, under “Vector”, select “Merge vector layers” via Data Management Tools. Select CSV and elect to save the file instead of use a temporary/scratch file (this is a common error). Open your csv in Excel for verification! 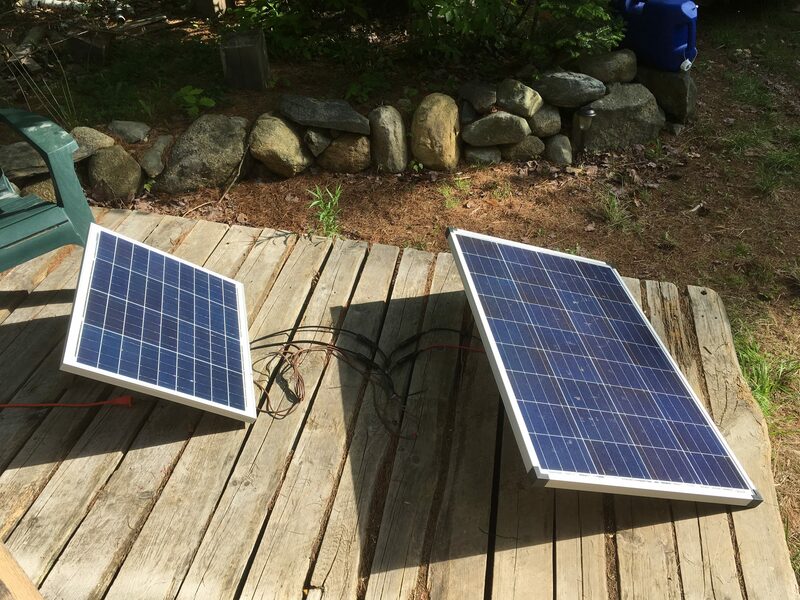 This 50w square panel had a junction box with MC4 connectors, the standard for small scale solar installations. As I was unsure how to know when we are running low on electricity reserves, I decided to make some adjustments. 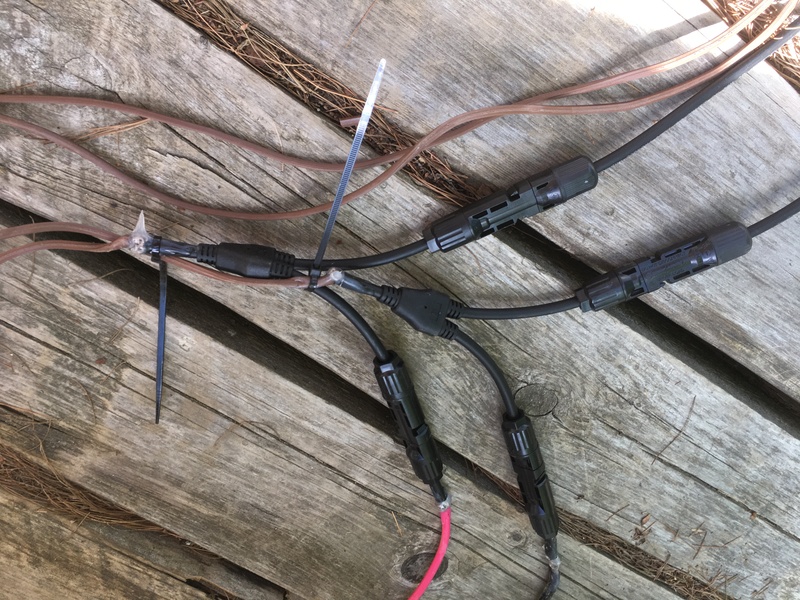 I traded my NEMA / USA two-prong connection with two MC4 splitters, such that both panels can run in parallel (into a standard USA 110v extension cord that goes into our hut). 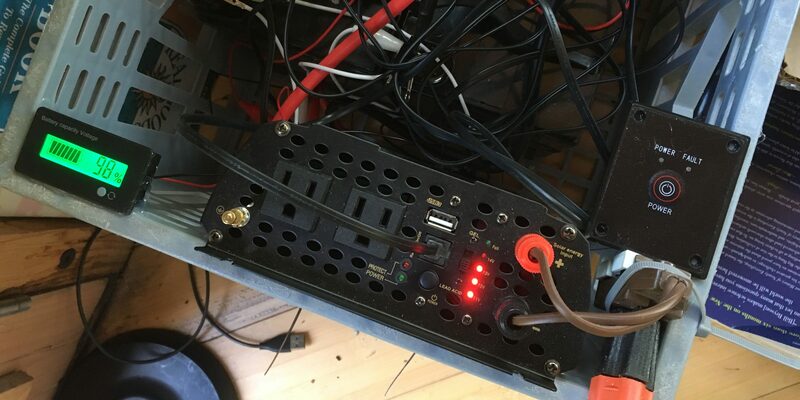 This way we should make well over one of the two 35ah batteries-worth of electricity a day.